Here are the first slew of acts to be announced for this year’s Electric Picnic in Stradbally, Co Laois from August 29 to 31. Tickets: between now and April 18, it’s €154.50 for a weekend ticket if you can prove you’ve been to three or more Picnics, €174.50 if you can prove you’ve been to the Picnic once or twice before and €194.50 if you have never been before. Tickets then increase to €194.50 until July 4 and, if there are any left, it will be €229.50 a pop after that date. If you want a day ticket for Sunday – and there’s no notion yet who will actually be playing on Sunday – it’s €90. You can add Ticketmaster’s fees to all of the above prices. 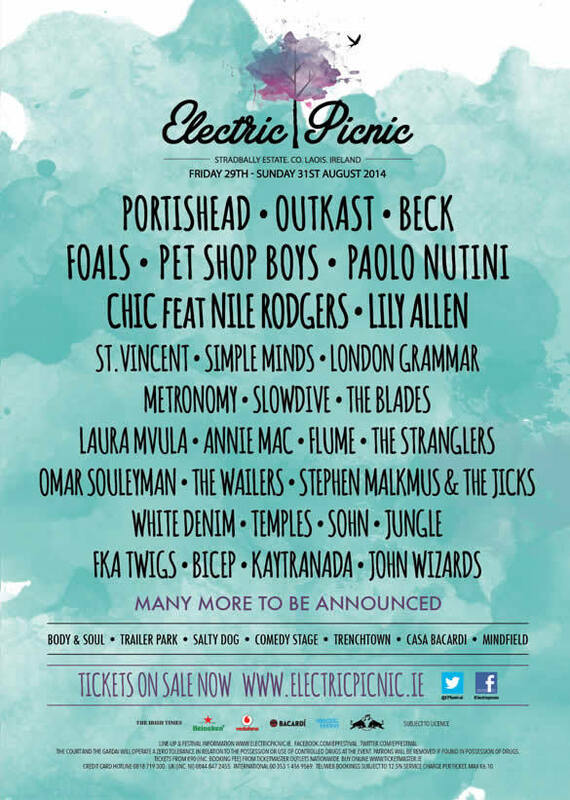 Kelly Travel will continue our long tradition of quality bus services to Electric Picnic 2014. Professional, fully licensed public bus services. Go to Electric Picnic with the Experts!